I lose count of the times I have walked past the Panama Dining Room on Smith Street. 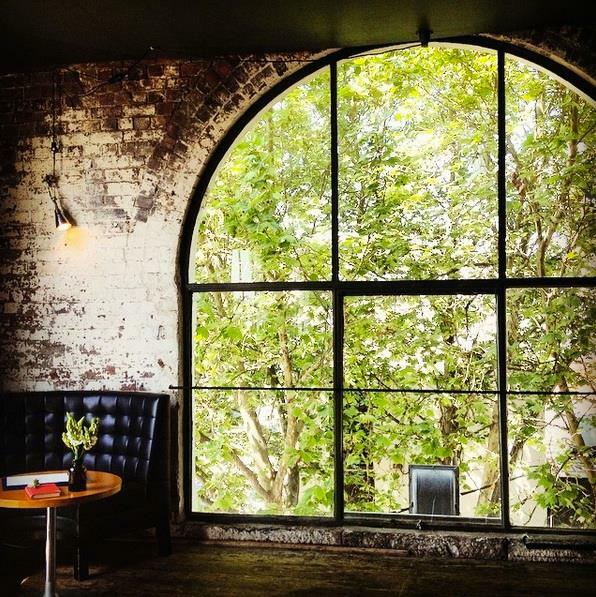 Perched on Level Three, it can be easy to miss this hidden gem in Fitzroy. And until last week, I had never dined there. It’s amazing how much Smith Street has changed over the years. 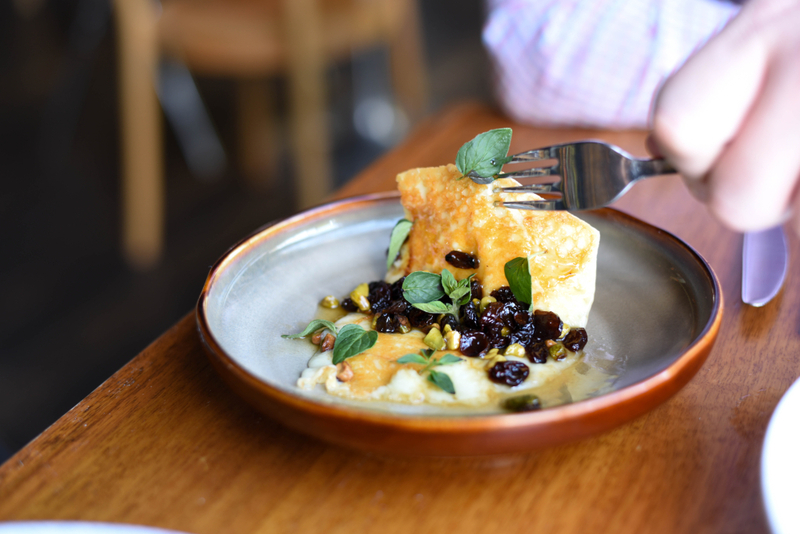 The gritty street has become one of the hottest eating and drinking strips in Melbourne. 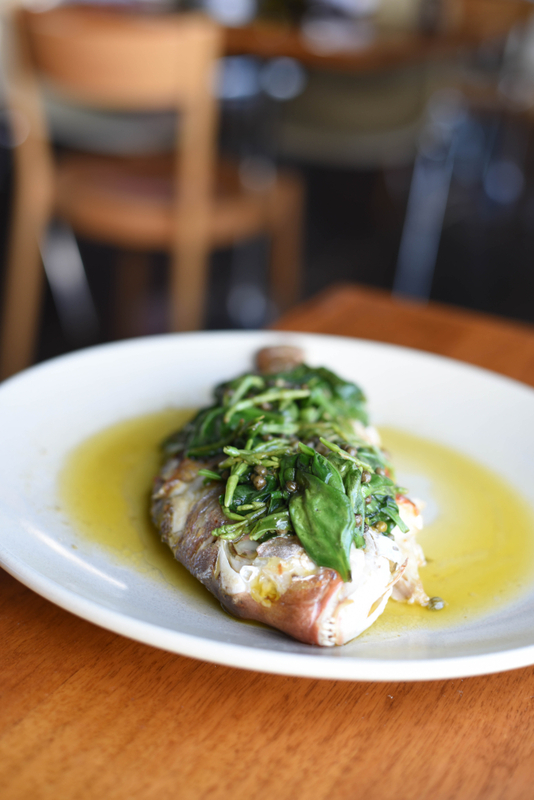 With neighbours like Saint Crispin, Rockwell and Son and Alimentari, it’s easy to see why. The biggest challenge of Panama Dining Room is the walk up. I’m not exactly at my peak fitness at the moment, so I am shamed to admit that a few flights of stairs was even in a struggle. Upon climbing the relatively nondescript staircase we were met by a stylish and entrancing space, one of the most beautiful warehouse conversions I have seen in a while. The dining room is a handsome space, with large lofty ceilings and gorgeous arched windows, elegantly carved from the exposed brick walls. Divided into a restaurant dining area and bar, the dining room is tastefully decorated with a mix of luxurious booths, patterned wallpaper and an eclectic collection of chairs and tables. There’s even a large pool table which is perfect for a game or two after a few cocktails in the evening. Panama Dining Room has changed significantly over the past 18 months. Previously it was known more for its bar; now the restaurant is a focus. 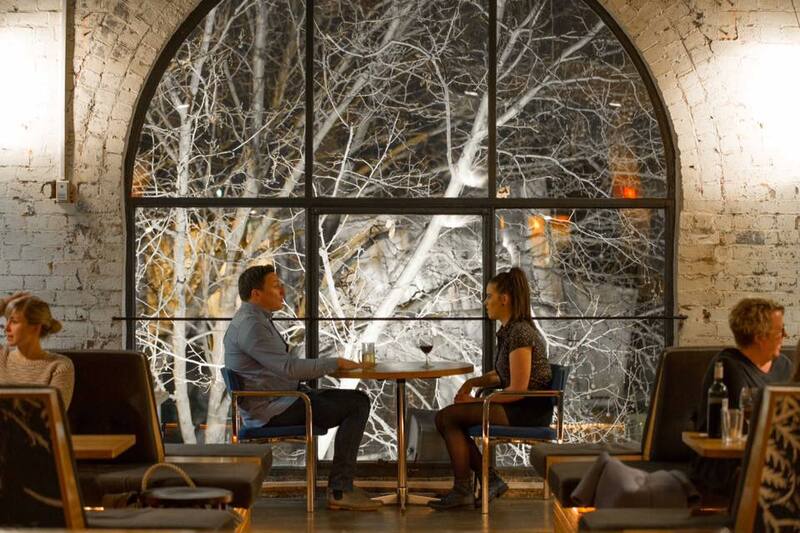 At the helm of the kitchen is Ayhan Erkoc (ex Noma, The Manse, Marque) who has crafted a contemporary menu of European influence, driven by fresh, seasonal and local produce and bold, punchy flavours. The food menu is well crafted and neatly divided into sections. Starting with the snacks and small plates, the oysters are served natural with a delicate cider emulsion and parsley oil, while vegetables aren’t scared to be the unsung hero. A plate of heirloom carrots are paired with cured yolk and brown butter, while the roast eggplant dip is another crowd pleaser, served with pickled lemon and parsley. Moving on to the mains, there’s a succulent duck teamed with carrots, caramelised yoghurt and dukkah and a melt in your mouth style pork belly with boudin noir. Or you can choose to share a gorgeous slow roasted lamb shoulder with roasted parsnips and smoked leeks. 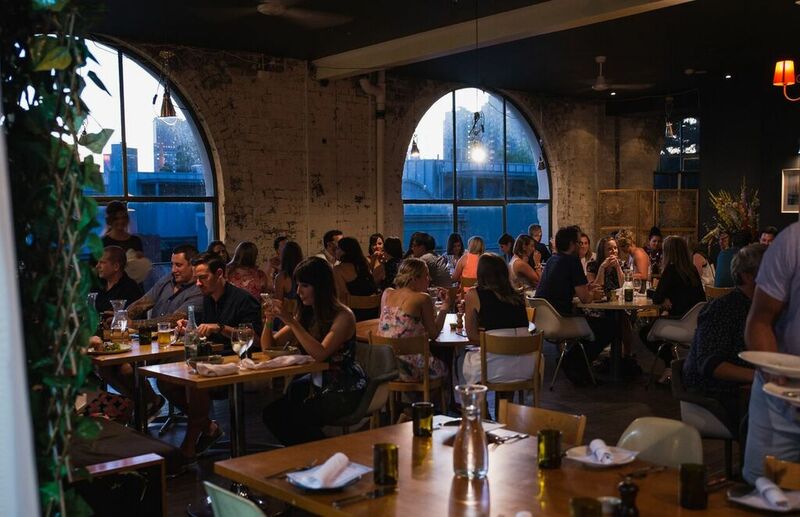 If you’re feeling indecisive just leave it up to the chef and enjoy the Fitzroy Feast, their signature ‘let us feed you menu’ for a very affordable $65 per person. 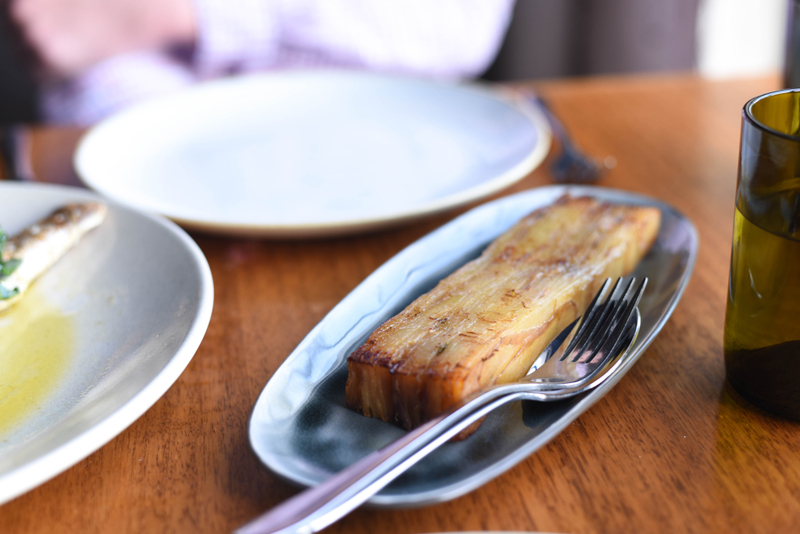 On the small plates we started with the saganaki, which was grilled to perfection, the slightly crispy golden outer revealing a soft gooey centre within. A shallow bath of honey was just enough to offset the saltiness of the cheese while the oregano, pistachio and sultanas provided a nice textural and flavour contrast. Definitely a dish to add to the must order list. 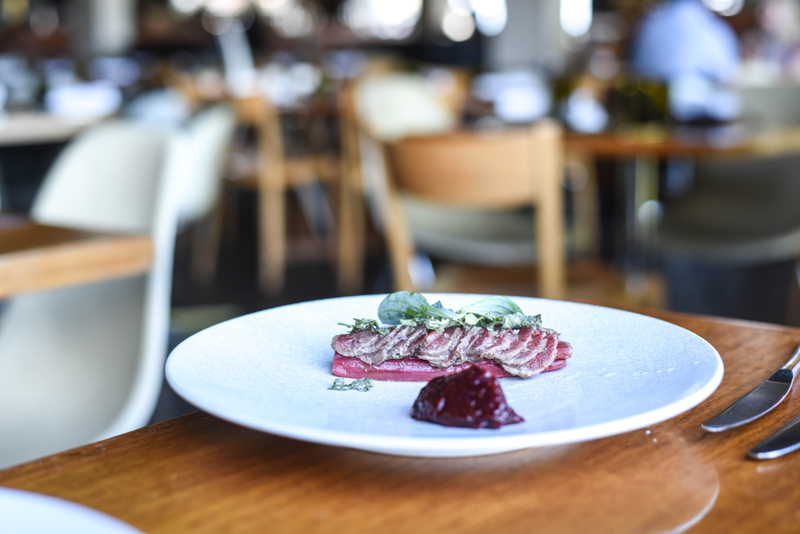 A picture perfect plate of beetroot was beautifully executed and really highlighted the beetroot as the hero of the dish. Glistening chunks of beetoot were teamed with smaller discs and wafer thin beetroot shards. 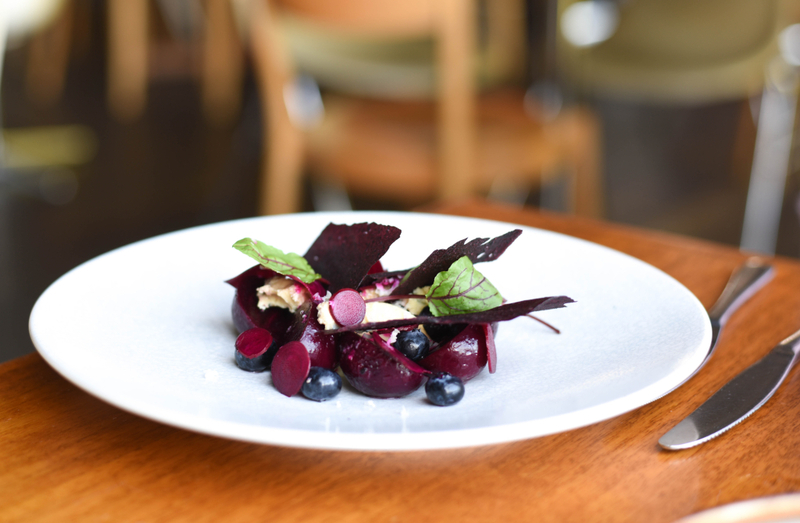 The Gippsland blue and fresh blueberries were nice accompaniments to cut through the earthiness of the beetroot, but I would have preferred it to have a bit more ‘bite’ to add a bit more flavour. Another interesting dish was the charred kangaroo with oyster leaf, plum and rhubarb. The kangaroo was slightly charred on the outside to give it an earthy barbequed flavour and served cold on a rhubarb stalk to provide a little sweetness and tartness. I wasn’t expecting the dish to be served cold, but it was perfect as a light summery dish. In winter time I would love the kangaroo and rhubarb to reveal more of the juice and flavour. 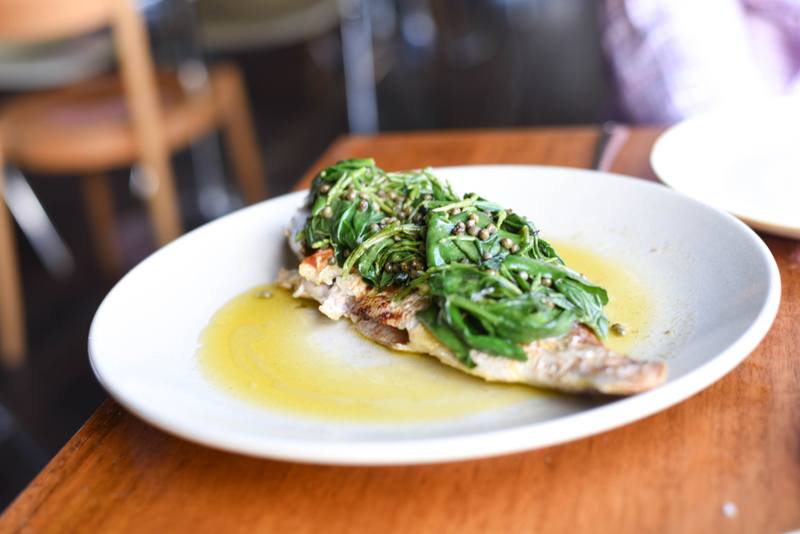 We couldn’t go past ordering the whole baked snapper, designed to share for two plus diners. The snapper was beautifully cooked, unashamedly falling apart with the slightest of fork nudges. A shallow bath of brown butter (beurre noisette – a French technique) provides a delicious nutty flavour to complement the fish without overpowering it. 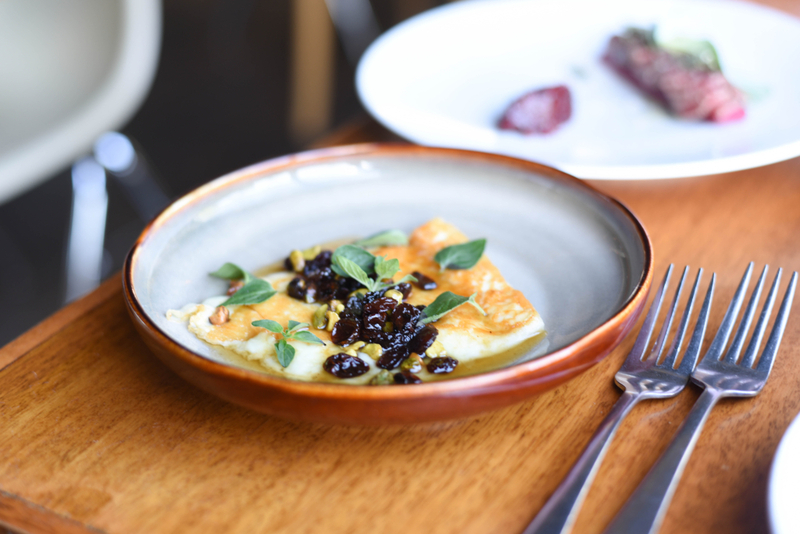 It’s great to see this French inspired dish given a Modern Australian twist with the addition of warrigal, indigenous greens. A side of boulangere potato, was the perfect accomplice for this delicious dish. The desserts menu is short and sweet, with three sweet varieties and a cheese platter with seasonal accompaniments. 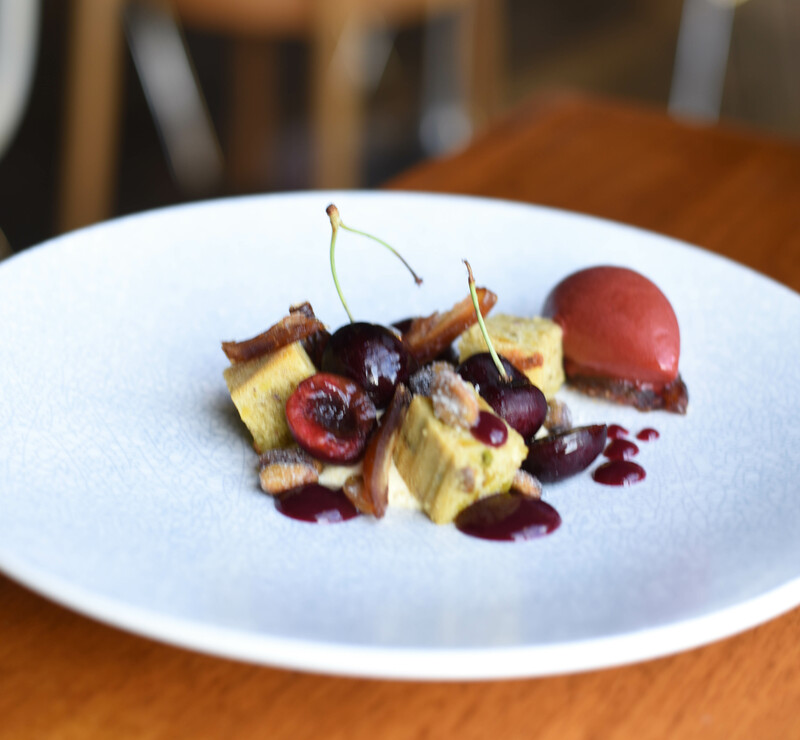 We opted for the cherries, served with baked vanilla custard, pistachio and date, a dish full of surprising texture and flavours. 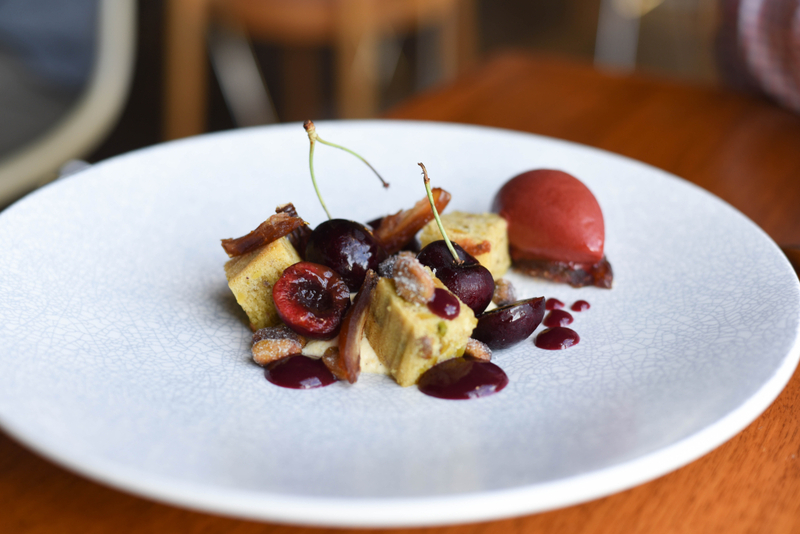 Cubes of pistachio packed sponge were paired with fresh cherries, slithers of dates and a zesty sorbet. I would have loved a little more baked vanilla custard but perhaps I am being a little greedy! 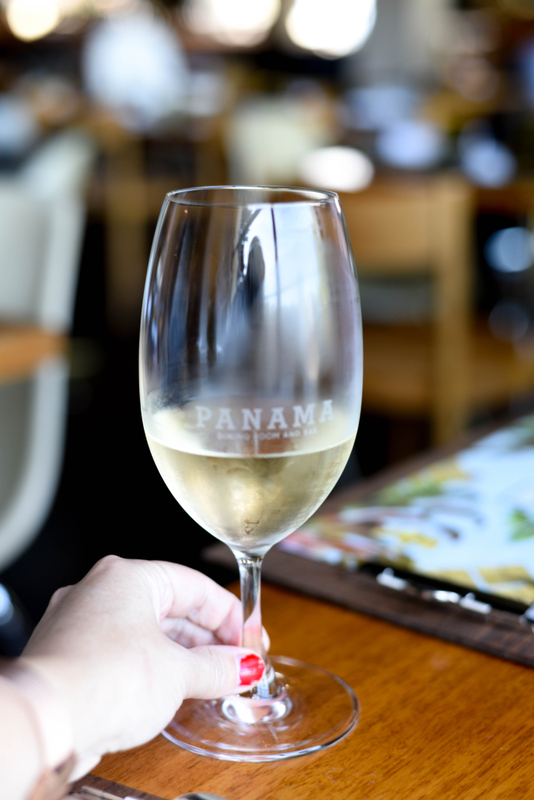 The drinks menu is equally impressive at Panama Dining Room with a great selection of single vineyard wines, craft beers and fine spirits on offer. Don’t leave home without ordering one of their mouthwatering cocktails and, if you’re feeling confident, join the pool sharks at the pool table. Panama Dining Room was definitely full of surprises and I was really impressed by the variety on the menu and its affordability. Next time I will definitely come back for Mother Shucker’s Oyster Happy Hour – oysters $1 each between 6 – 7pm everyday. How can you go wrong with that? Smith Street keeps getting better and better.